Description Of Item: The DC Universe just got smaller ? and more collectible! 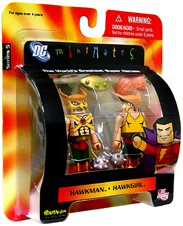 DC Direct and Art Asylum team up to deliver your favorite super-heroes with a MiniMates makeover! These figures range in size from 2-inch tall. Each 2 pack is blister-carded on a 4-color card. Collect them all!